Measuring before purchasing, budgeting before planning and painting before buying decor, rules that every good interior designer knows will apply to any project their working. An excellent home decorator would understand that breaking specific home interior design rules can help create an interior that is personalized, inviting and chic. Follow on to find out these eight interior design rules that Decor Aid’s interior decorators say everyone should break. Trust us, these rule breaks will make your home stand out, and you’ll thank us for the tips later. A group of matching dining chairs can complete the look of any dining room, but have you ever seen that one chair that you loved that had no match? If you ever had the urge to buy a great chair but didn’t because it had no pair, next time go with your instinct and break this interior design rule. Placing chairs of different materials, as well as various sizes and colors will undoubtedly bring character into your home’s dining area. Good home decorating doesn’t necessarily mean matching everything. Our home decorators point out that some of the best interior designs have just as much contrasting, as they have complimenting pieces. Some home decorators cringe at the thought of using fake plants, and while real plants have many significant benefits, we also know sometimes their upkeep is just not practical. Greenery, real or fake brings a visual breath of fresh air and livens up any room. In recent years faux plants have improved in looks and quality, making them ideal for those not looking to commit to the responsibility of daily plant care. Break this interior design rule and opt to decorate with fake greenery. Be sure to wipe and dust your faux plants, this way none of your visitors will know the difference. 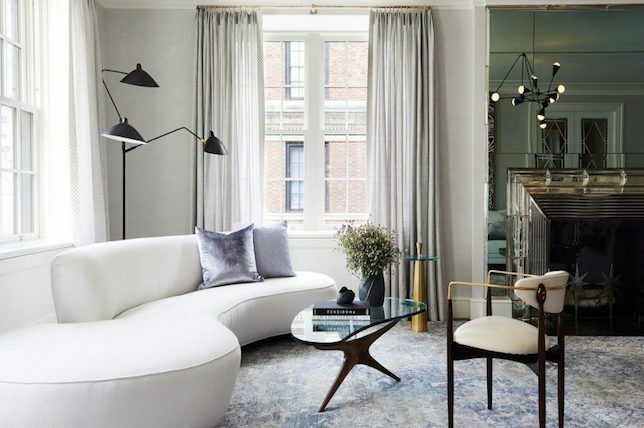 You don’t have to have gone to a fancy interior design school to have been taught that lighter colors create that illusion of space, this long-held interior design rule is the reason for several off-white or light gray painted rooms around the world. Darker colored paint may not make a place feel spacious and airy like brighter colors can, it can create depth. Matching darker paint with reflective and light decor will add to the room’s depth, making it hard for the human eye to determine where the walls begin and end. When decorating a space with darker colored paint, be sure to balance with metallics, mirrored decor, and you’ll see what you’ve been missing. This particular interior design rule isn’t as set in stone as others are, the problem is that some designers are just scared to be as bold as you need to be to match an argyle rug with an animal print sofa. Breaking this rule will give your space character and contrast. Successfully mixing crazy or bold patterns isn’t a skill you will acquire overnight. Which is why Decor Aid interior designers say to continually break this rule until you find the patterns that work for you and your space. Mixing funky patterns also will give you the opportunity to try out various styles, if you implement these bold designs in the form of throw pillows and other small accessories. Matching your wood finishes will ensure that all wood decor will compliment one another and create a sense unison and round out a room’s space. However, it can also leave an area looking one-dimensional and reminiscent of a log cabin. Whereas mixing wood finishes will give your home complimenting contrast and create a layered look that will give your home’s interior depth. While the finishes you can get away with matching is limited compared to mixing bold patterns, yet the results will be worth stepping into uncharted interior design territory. Sticking to one style, from a particular period, may sound like a safe way to design your home and guarantee satisfying results, yet this usually makes a home’s interior look dull, lifeless and museum-like. In fact, breaking this interior design rule will create depth, character and a sense of newness mixed with tradition. When looking to mix old furniture with newer items, you should start with the architecture of the room. Find pieces of the same era, then round out the feel of the space by incorporating modern lighting, contemporary rugs or even a few tech-infused decor pieces. Going with softer palettes and neutral shades will also help merge classic pieces with your more modern decor. It is no coincidence that there are several examples of symmetry found in nature and so many are attracted to spaces where there is symmetry amongst the decor. As attractive as symmetry can be if often limits how personalized you can make the room and also is the expected choice. Asymmetry is unexpected, unusual and helps your home avoid looking like a staged showroom. No one wants a boring home, right? Well throw this interior design rule out the window and go with the unexpected choice. Decor Aid interior designers suggest grouping items in odd numbers, incorporating different styles in one area and source pieces in various sizes. Now, this interior design rule you’ll want to follow at times and break when need, because, yes, adding pops of color can breathe life into a lackluster space. However, just because you add a hot pink accent wall isn’t a guarantee that your space will look any better. A room decked out with cool colors, and neutral tones can be just as visually pleasing as a room full of color. Pops of color can undoubtedly add personality, yet if done the wrong way can make an interior too whimsical, an eyesore and be quite the design overkill. Not every room in your house has to pop with color, try letting your neutral room shine. If you think a pop of color is needed, try starting with easy to swap accessories.